The brainchild of animator and director Tatia Rosenthal, $9.99 takes its inspiration from the short stories of feted Israeli author Etgar Keret. This inventive stop-motion feature boasts an array of homegrown talent in the voice cast. The story revolves around 28-year-old Dave (Samuel Johnson), whose halfhearted search for employment is stymied by his preoccupation with finding the reason for his existence. His father Jim (Anthony LaPaglia) doesn’t approve of these existentialist leanings, nor of the fact Dave has spent his last ten dollars on a book titled The Meaning of Life. Other characters, including the pair’s neighbours, a trio of pint-sized ruffians and the angel of a homeless man (Geoffrey Rush) round out the cast, and their stories and lives interweave in a rich and at times surrealistic exploration of hope. 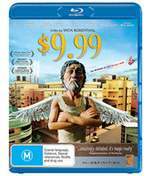 The product of nine years worth of work on the part of its tireless director, $9.99 represents the first Israeli-Australian co-production, with shooting taking place in Australia and post-production in Tel Aviv. The animation itself was, to put it mildly, a laborious process. Whereas the vocal performances were recorded in three weeks, production crews spent nearly a year bringing Rosenthal’s vision to life, with each day of work yielding approximately four seconds of footage. The end result is startling and hypnotic; a magic realist urban sprawl painstakingly crafted down to the most minute of details. Which is why the lack of bonus features on the BD release is such a disappointment. Though seemingly the perfect vehicle for a host of interviews and behind the scenes footage, all that’s on offer here are scene selection and the choice between DTS-HD and Dolby TrueHD 5.1 audio.